In the way of marifa`ah, in the way of Gnosticism, that to understand to reach that reality, that we are from the creation of Muhammadun Rasulullah (sallallahu alayhi wa sallam). That laa ilaaha ilAllah is not where we are existing. Then to understand that Muhammadun Rasulullah (sallallahu alayhi wa sallam) is that you cannot penetrate beyond your creation. Prophet (sallalahu alayhi wa sallam)’s light is from the light of Allah (Azza wa Jal). So Prophet (sallallahu alayhi wa sallam)’s Mi’raj is towards the realities of Allah (Azza wa Jal) and all the teachings of marifa’h is for us to understand that you are from and created from the oceans of Muhammadun Rasulullah (sallallahu alayhi wa sallam). Our mi’raj معراج (ascension) and the way of Ma’arif معارف means the Meem م of ‘Arif عارف , that our ‘Arifeen عارفين is towards the Meem م and the reality of Sayyidina Muhammad محمد (sallallahu alayhi wa sallam). May Allah (Azza wa Jal) grant us that mi’raj (ascension) into the heart of Prophet (sallallahu alayhi wa sallam). That the `Ashiqeen (lovers of Prophet (s)) with the love that they have for Prophet (sallallahu alayhi wa sallam); the love of Sayyidina Muhammad (sallallahu alayhi wa sallam) is calling them towards that presence. As soon as you begin to make a life of durood and salawaat the nazar (gaze) of Prophet (sallalahu alayhi wa sallam) begins to draw the soul back into its origin. That for us to understand, [Shaykh uses a compact disc – CD to illustrate]. Our life in the ocean of Muhammadun Rasulullah (sallallahu alayhi wa sallam) is a constant mi’raj (ascension). Anything in life that you move towards, Allah expands it. When you are in an airplane and you look at the horizon, you say, “O look we are going to go off the cliff” and as soon as you arrive to the horizon Allah (Azza wa Jal) provides another horizon. Means something at a distance looks like a dot and as soon as you move towards that reality, it begins to expand, because of your movement towards it.. Allah makes it to expand. It Means that My Reality is not for you, but My Qudrah (power), My House, is in the center of that understanding. In the center of this Creation is the qalb of Sayyidina Muhammad (sallallahu alayhi wa sallam). So as much as you move to that center you never reach because it keeps expanding. All of a sudden you see there is another horizon, you are continuing on your radius into the center, you thought you reached. Allah is expanding, and there is another horizon. This is the secret of this dunya. As much as you fly you think, “I am going to catch the setting sun,” and you fly, fly, fly and Oh! you reached a point, where the sun is now rising. You are never going to reach, and you go off that horizon as much as you’re moving into that reality, Allah is expanding the reality. This is the reality of `Arifeen and moving in the mi’raj that there souls are continually moving into Divinely Presence. Means from Hu, Allah, Ahad, because this is the Surah of Sincerity (ikhlas) and these are from the realities of the souls of sincerity. Then this circle is the Circle of Creation. Anyone else are still on that circumference but they must be looking at the wrong direction [away from the center] and they reach nowhere. So what Allah (Azza wa Jal) wants is sincerity (Ikhlas) for all Creation. That Prophet (sallalahu alayhi wa sallam), “Tell them: Qul huwa, Allahu Ahad.” [Shaykh shows the center point.] So the first level of marifa`ah is to come to Allah’s Oneness (Ahad). 2. Come to Allah اللهُ (the Radius) There is no God but Allah! 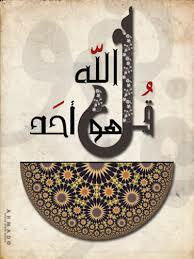 All the pr ophets who are the Rasuls (messengers), the ‘ra’ of the radius, come and teach us to say, “Allah”. 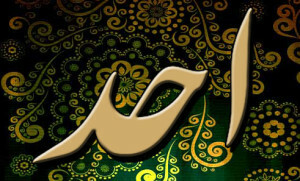 This Name contains all Names and has no plural, has no partner, “Come to Allah.” So it means you have not yet reached marifa`ah, because now you will begin to understand; why certain people are saying the same things, they say, “Allah”, they say, “Prophet” (sallallahu alayhi wa sallam) but they are reaching to nothing. They are not reaching to marifa`ah. Because all Ahl al Kitaab also say, “Allah”. And here everyone says, “laa ilaaha ilAllah” [on the circumference]. 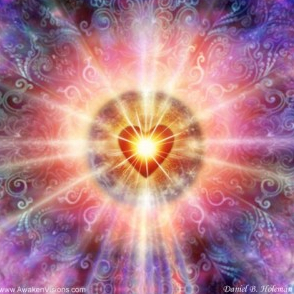 All of this [outer level] is still imitated because yet you did not reach the Divinely Presence [the center]. 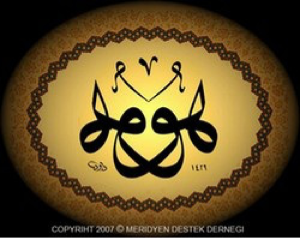 It means come to Allah’s Ahad, Oneness, so the whole world you bring them to Allah’s Oneness. As soon as you move on the circumference that: all My Rasuls, all My Messengers, all the Message that I brought was to come to Allah. It begins to clarify for us that now Ismullah is here [at the center point] but this is still an imitated reality. 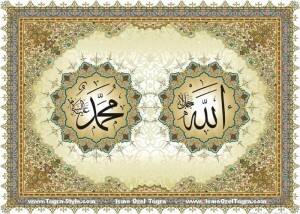 That Allah, that you are saying, “Allah, Allah, Allah, Allah,” it is from you. This (CD) is an example of the circle [holds disc to show circumference]. Everything is on this Circle of Creation. This outside is ‘Ahad’, is One, because there can be only one Circle of Creation; there can’t be many Circles of Creation. This circle can be infinitely large or small. That is why when you look at the Hubble it shows you a circle. 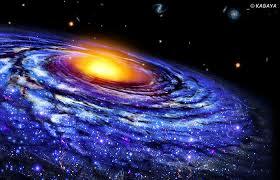 It has galaxies, billions of galaxies, billions of universes, they say eighteen billion universes. 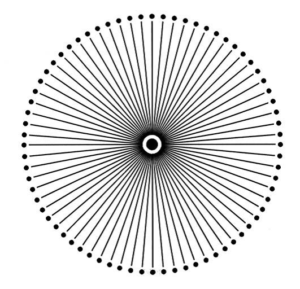 When they zoom out, it is a circle. You zoom in, it is massive, you can’t reach from one end to the other. For example that is why the halaqa حلقة (circle) , Halaqa az Zikr حلقة ذكر (circle of remembrance), everything for us is a halaqa to teach the reality. That in this halaqa, the Circle of Creation, that you are still imitating, you want to take the way of `Arifeen, now come. Come on the way of the Prophets. Qul Hu Allah Ahad. Ahad Allah Hu. That is why all the Spiritual Order tareeq’s say, “Allah Hu, Allah Hu, Allah Hu اللهُ هو ,” because the responsibility of the turuq, all the Ahl as-Sunnah wal Jama`ah shaykhs have a responsibility to bring people to the Oneness; bring them to no shirk, no partner with Allah (Azza wa Jal) [Ahad]. Bring them to Zikrullah and to love and respect of Allah (Azza wa Jal) [Allah].Bring them to hidayat and the Ha will begin to guide them. Use your five senses. And Allah (Azza wa Jal)’s Ha and the Waw [Hu], because Allah (Azza wa Jal) is going to teach that “You cannot come to this Hu!”[Hu of Allah], because now you’re reaching the Hu [at the center]. Allah (Azza wa Jal) says in Holy Qur’an: you want My Love, you didn’t get it yet, the only one whom I love is Sayyidina Muhammad (sallallahu alayhi wa sallam), he is My Habib (beloved). All the Prophets were struggling for Allah’s Love. All Creation is struggling for Allah’s Love, but whom Allah loves is His Habib (alayhis salaato was salaam), Sayyidina Muhammad (sallallahu alayhi wa sallam). Allah’s warning for us, advice for us: qul in kuntum tuhiboon allaha fattabioonee [Say, [O Muhammad], “If you should love Allah, then follow me]. Means the Hu is going to open. The Hu of Allah (Azza wa Jal), no, no, you are not there. But the Hu that is closest to you, the unique he-ness, that there is no likeness unto Prophet (sallallahu alayhi wa sallam). There are no two ‘Muhammadun Rasulullah’ (sallallahu alayhi wa sallam). 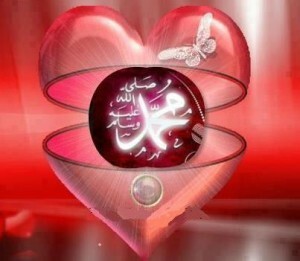 There is no one in Creation that is the likeness of Sayyidina Muhammad (sallallahu alayhi wa sallam). And what Allah (Azza wa Jal) loves of Sayyidina Muhammad (sallallahu alayhi wa sallam). 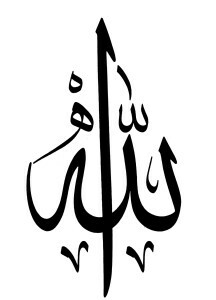 As Allah (Azza wa Jal) is uniquely Ahad احد (The One, , Sayyidina Muhammad (sallallahu alayhi wa sallam) is uniquely Wahid واحد (The Unique, The Single). He is the Ahad with the waw و “Wahid واحد ”. The center is teaching us, “Come, come to My Uniqueness.” You came to Ahad, You came to Allah (AJ), “The Ha of Allah (Azza wa Jal) is guiding you to My Hu. “Come to My Hu,Come to My Hu” and the Hu is beginning to reflect out that this is now qul in kuntum tuhibonallah fattabionee, is the Hu of Haqiqat al-Muhammadiyya. 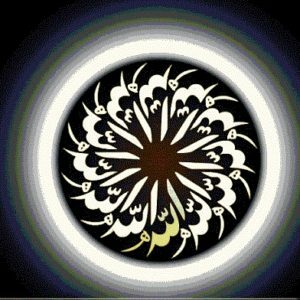 If this [Shaykh indicates the entire circle] is Muhammadun Rasulullah, then this [Shaykh points at the center] is the Qalb of Sayyidina Muhammad (sallallahu alayhi wa sallam). This Qalb of Sayyidina Muhammad (sallallahu alayhi wa sallam) [center point] just immediately expanded. When it expands, then where is the Hu? It moved to here [the circumference] because the circle expanded. Right? You came to the Hu [at the center] as soon as you move into a marifa`ah it begins to expand [becoming another circumference]. When it expands you are entering into Hu. And as soon as you arriving at that point [at the center], Allah (Azza wa Jal) is going to expand that reality that you are never going to reach. You will never reach, as much as you move, the speed of light is moving away from you at the same speed. As much as you move in the world of light, light is at a constant, it is moving infinitely away from you. You can never catch up with light. Qaaba Qawsayni aw Adnaa, it is continuously expanding. But as you move into this Hu, this Hu expands and it gives you another circumference. These are all the Ahlul Hu (people of Hu), are all the Muhibeen, all the `Ashiqeen, their circumference is in that Divinely Kingdom. Then Allah (Azza wa Jal) begins to open the realities of ikhlas, because in this “huwiya”, in this reality of Hu, they are in the heart of Sayyidina Muhammad (sallallahu alayhi wa sallam). Because this is your soul and your soul is moving in a mi’raj and as soon it moves into the Heavenly Kingdom, there is no shareek (partner) with Allah (Azza wa Jal), there is no way to meet Allah (Azza wa Jal). Means you cannot approach that reality, wa qalbun mu’min baytullah. The only Mu’min for Allah (Azza wa Jal) that Allah (Azza wa Jal) is counting on this reality, is Prophet (sallallahu alayhi wa sallam)! This is the Muhammadan Reality that: I am the House of this heart of Sayyidna Muhammad (sallallahu alayhi wa sallam). What makes the Ka`bah to be holy? Is qalbun mu’min baytullah. 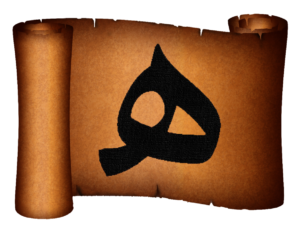 That all the mu’min must be gathered in this reality. 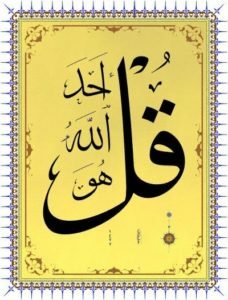 Allah (Azza wa Jal) says: I am with the Nabiyeen, Siddiqeen, Shuhada wa Saliheen and this is the best of company to keep. It means for that reality you are now moving into Allah (Azza wa Jal)’s Divinely Presence. As soon as this [the center] expands, this [the circumference] becomes the people of Hu, their Zikr is “Allah”. Their Zikr of “Allah” is the real Zikr of Allah (Azza wa Jal) because they are in the heart of Prophet (sallallah alayhi wa sallam). When they make Zikr of Allah (Azza wa Jal) with their arwah, their souls, it is a real Zikr of Allah because it is the Zikr of Prophet (sallallahu alayhi wa sallam) making Zikr of Allah (Azza wa Jal). 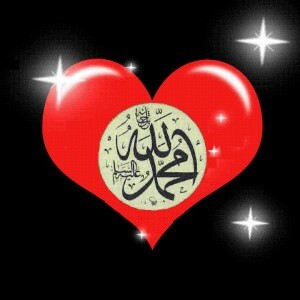 He was not tortured because of his love for Allah (Azza wa Jal). Because you can have love for Allah (Azza wa Jal) and nobody knows what you believe. You keep love of Allah (Azza wa Jal) in your heart and nobody knows what you are doing. But as soon as you put your turban, your beard, your Sunnah, you are a Muhammadiyoon! We are going to have a problem with you. That was the struggle. Means that is what Prophet (sallalahu alayhi wa sallam) wanted for us. These are the `Ashiqeen, that for the love of Sayyidina Muhammad (sallallahu alayhi wa sallam), Allah (Azza wa Jal) has let their souls go into the heart of Prophet (sallalahu alayhi wa sallam). In the heart of Prophet (sallallahu alayhi wa sallam) their Zikr of Allah (Azza wa Jal) is real, because Prophet (sallallahu alayhi wa sallam) is making that Zikr! And dressing their souls from that reality. At that time Prophet (sallallahu alayhi wa sallam) lets their soul look at that horizon, and what do they see? They see, Ahad, Ahad, Ahad, and to be dressed from that reality. Okay, but Paradise is huge. You may be on the outside of Paradise. You say, “Laa ilaaha ilAllah,” you have only said by imitation. What Allah (Azza wa Jal) wants for Creation is to say, “Laa ilaaha ilAllah and you come into My Paradises,” but Allah wants to give us the best of Creation and to say, “Muhammadun Rasulullah, (sallallahu alayhi wa sallam). “I will give you Maqaam al-Mahmud.” Sayyidina Mahmud is Prophet (sallallahu alayhi wa sallam). It means Then you are saying, “Laa ilaaha ilAllah,” here [at the circumference] but when you come, come, come [towards the center]. Allah (Azza wa Jal) inspires that, “You are sincere in your laa ilaaha ilAllah, I want to introduce you to My Beloved, Muhammadun Rasulullah (sallallahu alayhi wa sallam).” At that time again ‘Ashiqeen they enter into Muhammadun Rasulullah (sallallahu alayhi wa sallam) and in the heart of Prophet (sallallahu alayhi wa sallam) they now make Zikr, “Laa ilaaha ilAllah, laa ilaaha ilAllah.” Laa ilaaha ilAllah from Maqaam al-Mahmood [center point] is different from the Zikr outside [of the circumference]. 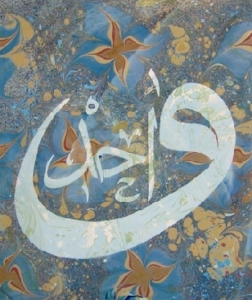 It means constant Mi’raj, constant Mi’raj, constant movement towards realities. Not everybody’s Zikr is the same, not everybody’s understanding is the same and most definitely not everybody’s soul is in the same location. Subhaana rabbika rabbil `izzati `amma yasifoon wa salaamun `alal mursaleen wal hamdulillah rabbil `aalameen. Bi hurmati Muhammad al-Mustafa wa bi sirri surat al-Fatiha.